Brandy Rodriguez about had a cow when she saw the Chick-fil-A mascot was really her soldier husband in disguise. FAYETTEVILLE, NC (WTVD) -- A Fort Bragg Army wife and mom-to-be got quite the surprise after breakfast at Chick-fil-A on Wednesday morning. 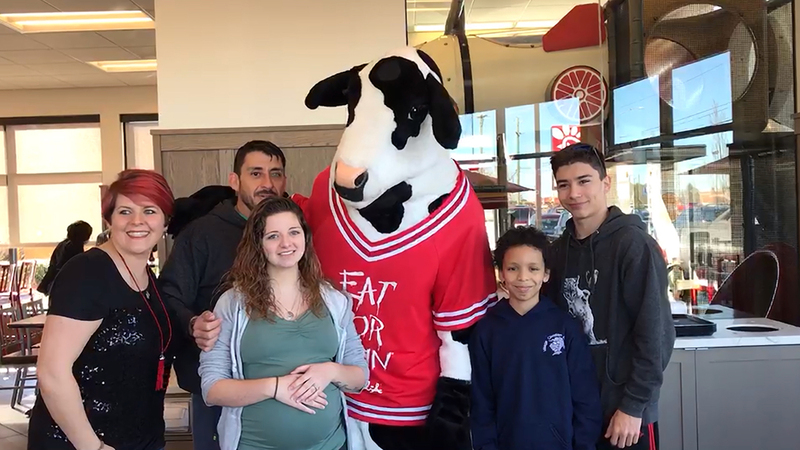 Brandy Rodriguez was posing for a picture with her in-laws and the Chick-fil-A cow at the restaurant on Skibo Road when all of a sudden, she turned around to see her husband, Antonio, home from deployment, coming out of the costume. The soldier and his family had been planning the surprise homecoming for weeks and Brandy had no idea he had returned. Denise Windsor, Chick-fil-A Marketing Director, said while recording the video that's now been viewed thousands of times on Facebook, staff began to cry and customers started clapping for the happy reunion. "At Chick-fil-A, we love the military," Windsor told ABC11. "Any chance that we can get to help make special moments for them, it's our pleasure." Antonio and Brandy are expecting their first child, due in about six weeks.